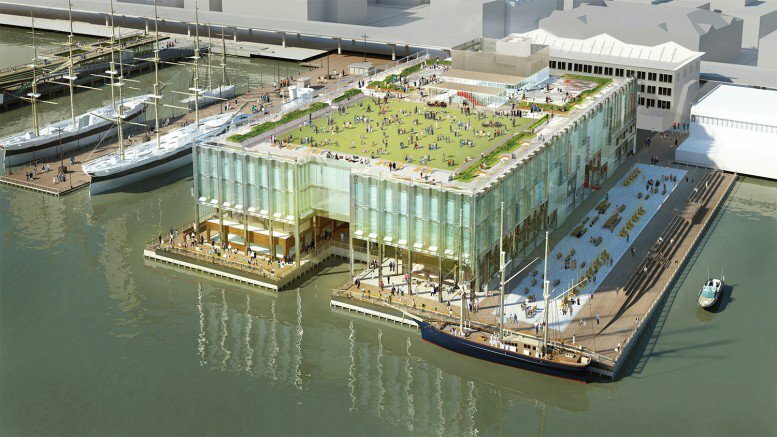 On October 20, the Landmarks Preservation Commission (LPC) approved the Howard Hughes Corporation and SHoP Architects‘ re-visioning of the South Street Seaport’s Pier 17—with one crucial change. The developers will comply with the LPC’s request to remove a glass pergola shading the rooftop lawn. The 250,000-square-foot, $200 million Pier 17 retail mall and public space is the anchor of the Seaport makeover. Though the LPC approved the design in 2013 (and construction has begun), the LPC review last week was precipitated by the addition of the pergola and the demolition of the adjacent Link Building, two unapproved aspects of the initial development plan. 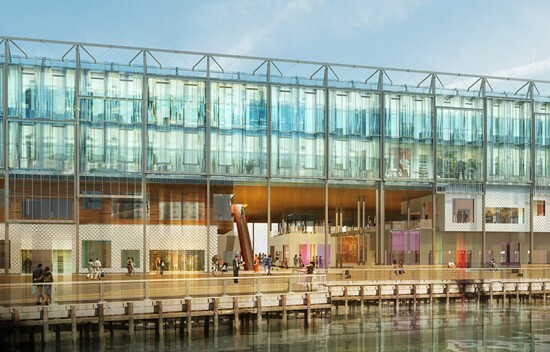 When the pier plan was introduced in August, the LPC raised concerns about the pergola. 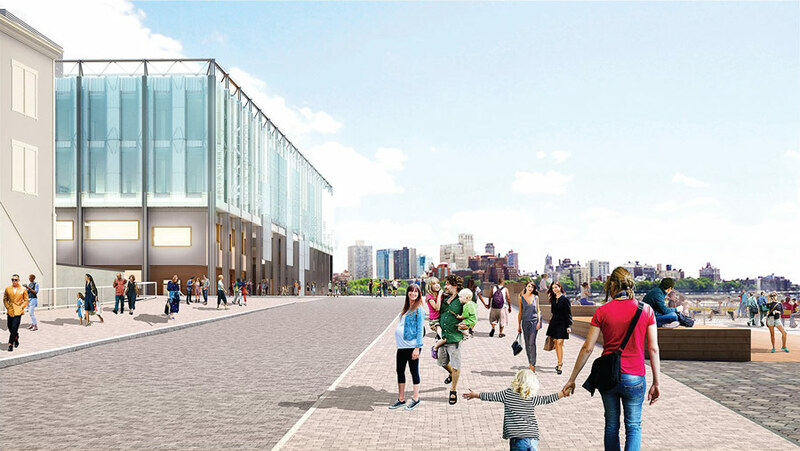 Neighbors’ fears were classic NIMBY: residents worried that covering the lawn would draw bigger crowds to the Seaport’s popular concerts and events. 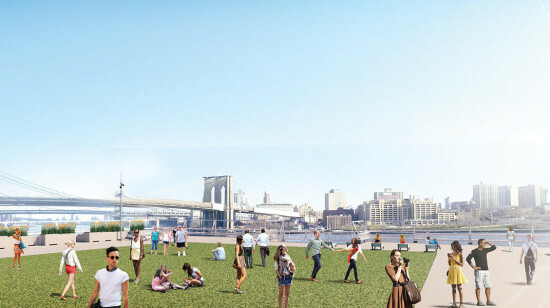 Though the LPC can’t regulate city vistas, neighbors also voiced concerns that the pergola would block views of the Brooklyn Bridge. Now, residents will enjoy unobstructed—or at least less obstructed—views of the bridge, as well the last coup from the LPC meeting: modified paving on the site’s access road. The road is an extension of Fulton Street that will encircle the front of the pier. Instead of asphalt, visitors will tread on precast concrete pavers. Though the Pier 17 deal seems like a relatively utopian public-private compromise, controversy over the overall development looms. Neighbors and preservationists have greeted SHoP’s planned, 42 story, 500 tower with vociferous opposition. While the tower is not in a historic district, and thus outside the LPC’s purview, the community continues to debate the project. Another major (and potentially contentious) project in the area is the S. Russell Groves–designed, 60 story skyscraper at 151 Maiden Lane, announced in September. The typology of the South Street Seaport reflects its status as one of New York’s oldest districts. Like all historic neighborhoods, it must contend with the priorities of a densifying city. It remains to be seen how SHoP’s plan, and other nearby redevelopments, impact the district’s function and character.